Can you imagine a neon light display projected onto the world-famous Sydney Opera House? How about the Royal Botanic Garden coming alive under a canopy of millions of tiny lights? 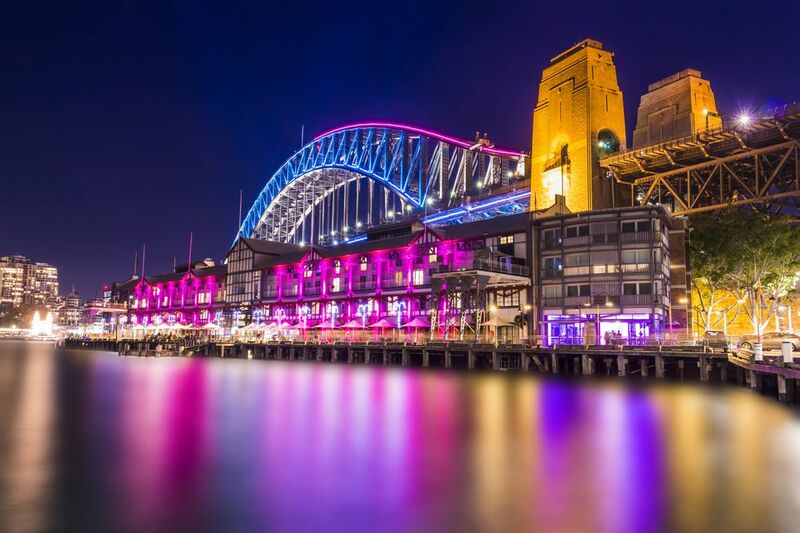 Sydney’s most iconic landmarks, alongside waterfront mansions, office buildings, restaurant strips and even public transport, erupt into a spectacular visual tapestry of colour and wonder each year for the Vivid Festival. Trust us when we say that you’ve never seen anything quite like this before! “Our city comes alive during Vivid,” raves radio journalist Keegan of the annual light extravaganza. “There are so many things to see across the CBD and the lights shows and interactive displays compliment the natural beauty of our stunning Harbour City. Sydneysider Ursula is equally as impressed by the annual festival, which entertains visitors and also inspires locals to explore other parts of the city that they’re not as familiar with. In 2016, you can watch in wonder as all the stunning landmarks come to life between May 27 and June 18. Here are some of the not-to-be-missed highlights! An incredible production involving massive video projected water-screens, fountains, flame jets and lasers. The harbour explodes in a spectacle of colour to deliver ferocious dragons and the characters of commedia dell’arte. Imagine 150 litres of tonic water suspended above your head. Now add light. Little kids and big kids alike will be mesmerised by this stunning sustainable lighting installation that transforms a laneway at The Rocks. As a child is born somewhere in the world (in real time), a ‘human water droplet’ will spring from the Fountain and float to the ground, before walking off into their future. A super-cool take on the human life cycle and our growing population, this thought-provoking installation is positioned in Sydney’s business epicentre, Martin Place. Consider yourself something of a Pinball Whiz? This interactive installation allows you to enter the Wormhole Galaxy portal for a ‘pinball style contest’ where you need to work together to find hidden hot spots and collect bonus points. Whether you’re 12, 32 or 72, this is loads of fun! There’s nothing more romantic than proving how much you love your partner by shouting it out in front of a crowd of strangers. The giant heart-shaped ‘Love-O-Metre’ will measure your devotion, as it invites couples to loudly declare their love, which will then literally light up the skies as their love is amplified in light! This breathtaking interactive installation feeds off the energy of the crowd. The cocoon is designed to pick up on the collective mood of participants and then reflect those feelings through colour and movement. The Harbour’s ferries, cruise ships and other vessels get involved to light up the iconic body of water. How Much: You can witness the lights from the shore for FREE, or jump on board a cruise with varying prices. Have your camera ready to see the Opera House like never before. This year indigenous art will transform the iconic building in a celebration of spirituality and culture. Six different artists from six different clans, national estates and territories have been chosen to create this piece exclusively for Vivid Sydney. This 70-metre long tunnel is illuminated by thousands of tiny LED light globes to create the atmosphere of a church to draw “people out of the darkness and towards the metaphoric light”. A combination of 3D animation, motion design, stop motion and edited video footage ­­– along with music – creates the illusion the building’s façade is being carved, painted, cut and brushed. This is a great one for the kids! They get to dress up in special suits to “encounter the wonders that exist at the bottom of the ocean”. With a uniquely historical bent, all installations and activities in the Vivid Chatswood experience are inspired by the animals of Gondwana, an ancient supercontinent more than 500 million years old! Will humans ever be replaced by machines? Spectacular colour and movement shines over the façade of the heritage-listed Carlton & United Brewery explores this very concept while taking you on a journey of the changing human workplace. It demonstrates what the factory once was and how computers and machines have now taken the place of many workers. Giant lanterns of an elephant, platypus, crocodile, echidna and more will be displayed throughout the Zoo along with thousands of smaller lanterns made by school students. More than 180 films from dozens of countries will screen across the city and as far as the Skyline Drive-In at Blacktown. You can also take part in Q&As, parties and other special events. A panel of experts, teachers, industry leaders and girls will chat about why females are underrepresented in the occupations of scientists, technologists, engineers and mathematicians. There are around 90 music events across the city during the festival, with an array of local and international acts to play live at the Newtown Social Club throughout the festival. Search online for your favourite musician for dates, times and tickets. As if there’s not enough already to entertain, inspire and delight, there are also hundreds of ideas-based discussions, movies, conferences and workshops planned as part of Vivid Sydney. Looking for accommodation? Trip Advisor has the best Sydney Hotel deals. Strolling on foot is a great way to see and explore many of the incredible displays of Vivid Sydney, particularly the interactive installations. Plenty are within walking distance of each other and you can then take public transport to other destinations when needed. There will be extra public transport services operating during the entire run of the festival. The best train stops to see displays will be City Circle, Martin Place, Chatswood and Redfern. Buses on major routes will also operate 24-hours a day. If you want to jump on a ferry, remember to be organised and patient. Also note that due to road closures and congestion, taking your car is not the best option. For great sydney hotel and accommodation deals, check out Trip Advisor.